You may call me “Domestic Diva” today. I’ve harvested the garlic I planted last fall, and it’s curing outside. 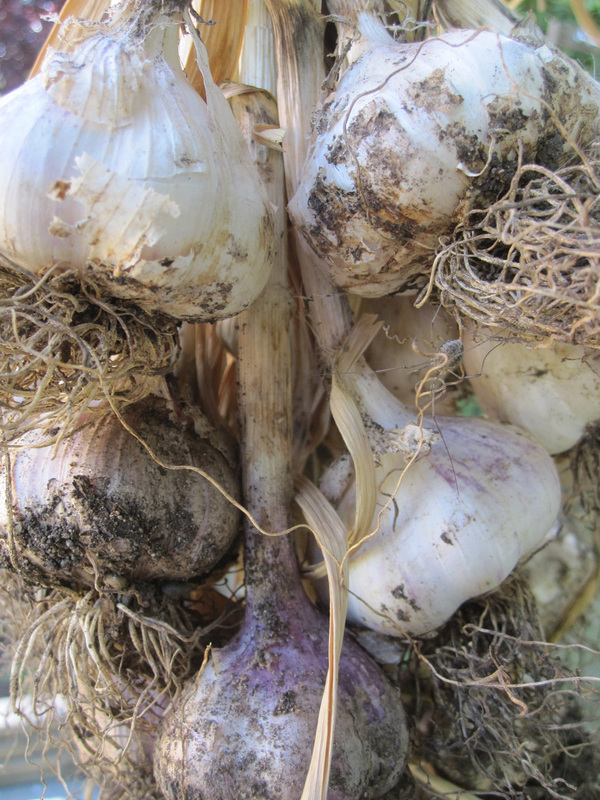 And I’m thinking about which variety to plant this year–it’s good to order seed garlic early, since it tends to sell out. I’m leaning toward a softneck variety like ‘Inchelium Red’ or ‘Siskiyou Purple’. The hardnecks have the greatest range of flavor, but softnecks store well. Also drying are cherries, apricots, peaches, and blueberries. From now till the end of September, I will dry fruits and vegetables every weekend. Whatever is fresh and local now will keep me nourished for the next whole year. Having dried produce on hand gives me options as I pack for backcountry trips, as I am doing today. Tomorrow we hike to Waptus Lake to stay the week, and I’ll be nibbling on dried cherries. We are planning a pesto dinner, and there will be home-baked desserts every night. Living nine miles from the road for a few days does not mean meager rations. Food is fuel for our work, and anticipation of meals keeps the spirits up. Speaking of anticipation, my favorite summer holiday is coming up. That’s right: Sneak Some Zucchini onto Your Neighbor’s Porch Day is August 8th. I’ve been checking my plants daily and giving them plenty of water. They got planted late and languished during June. They are quite perky now, and I will harvest some small fruits when I get home from Waptus. A true Domestic Diva would never flinch from zucchini. She would transform them into something delicious, and pop the excess into the freezer to enjoy next winter.